An Associate in Business Administration degree provides graduates with the foundational business knowledge necessary for a variety of entry-level business jobs, such as entry-level business management positions. Degree-holders have business skills that they can use in many industries. An online Associate degree in Business also provides a path to a Bachelor’s in Business Administration degree program. Any interest in a pursuing a bachelor’s degree? Learn what you can do with an online bachelor’s degree in The 25 Best Online Bachelor in Business Administration Degree Programs. 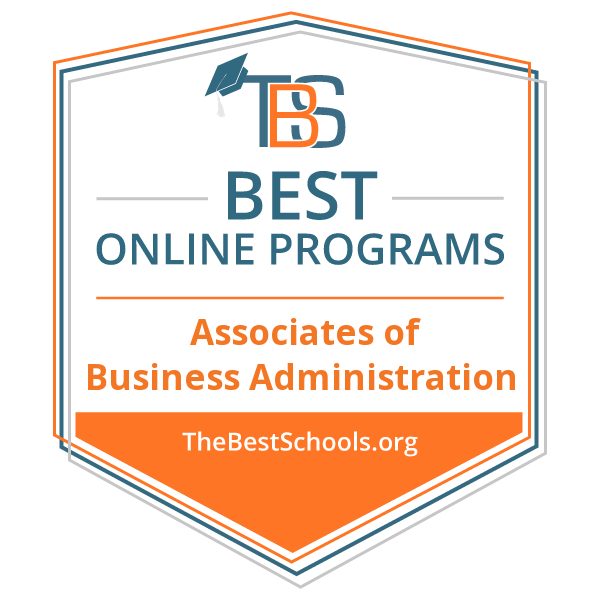 What Is an Associate in Business Administration Degree? How Long Does It Take to Complete an Online Associate in Business Administration Degree Program? What Is an Associate of Applied Science (A.A.S.) in Business Administration Degree Program? What Kinds of Jobs Can I Do with an Associate in Business Administration Degree? How Much Can I Earn with an Associate in Business Administration Degree? We selected the schools based on the quality of the online Associate degree in Business programs, the types of courses offered, and the faculty, rankings, awards and reputation, which includes the school’s reputation for effectively providing quality online degree programs. Dallas Baptist University is a private Christian liberal arts university that was established in 1898. It enrolls over 5,000 students in a variety of undergraduate, graduate and professional degree programs. The school was originally named the Decatur Baptist College, and it was headquartered in Decatur until 1965. Dallas Baptist University offers an online associate in business administration degree program which teaches students foundational business knowledge. Students earning their online business associate degree from Dallas Baptist must complete foundational coursework in Christianity and religion. Crown College is a private Christian college that was established in 1916. It enrolls a small student population of under 1,500 students in a variety of undergraduate and graduate degree programs. The school was originally founded as a training school for Christian missionaries. Since then, the college has significantly expanded its curriculum. Crown College offers an online associate degree in business program that provides students with the knowledge and skills they need for a wide variety of career paths. Students earning their online business associate degree at Crown College must complete a Christian studies core. Crown College is accredited by the Higher Learning Commission (HLC). Thomas Edison State University is a public university that was established in 1972. It enrolls around 15,200 students in a variety of undergraduate, graduate and professional degree programs. The university’s name is a tribute to the famed American inventor. The School of Business and Management at Thomas Edison State University offers an online associate in science in business administration degree program which is designed for students who want to advance into a bachelor’s degree program after completing their first degree. Thomas Edison State University is accredited by the Middle States Commission on Higher Education (MSCHE). Florida Institute of Technology, also known as Florida Tech, is a private school with an enrollment of over 6,000 students. The school was originally founded in 1958 to support the burgeoning space program. Since then, the school has branched out and now offers a wide variety of degree programs, many of which are completely online. Florida Tech offers a 61-credit-hour Associate of Arts in Business Administration degree, which takes roughly 18 months to complete online. Classes are taught in eight-week periods. The online Associate degree in Business Administration program combines a liberal arts education with business-focused classes to prepare graduates for their business careers. In addition to teaching core business subfields like accounting and business law, the program helps students to hone their communication and professional skills. Florida Institute of Technology is accredited by the Southern Association of Colleges and Schools Commission on Colleges (SACSCOC). Penn State World Campus is the online campus of Pennsylvania State University. It launched in 1998 and currently provides over 150 undergraduate and graduate degrees online as well as online certificates in a variety of program areas. Penn State World Campus offers a fully online Associate of Science in Business Administration program. While the degree can stand alone, graduates may apply all their credits towards a bachelor’s degree at Penn State or other institutions. Penn State World Campus tailors their program for both entry-level business professionals and experienced business professionals who seek degrees for career advancement. Credits from the Penn State online business associate degree can be applied toward the university’s online Bachelor of Science in business program. Penn State University is accredited by the Middle States Commission on Higher Education (MSCHE). Liberty University is an evangelical Christian university that was established in 1971 by evangelical pastor Jerry Falwell. Liberty enrolls over 75,000 students in a full array of traditional and online undergraduate, graduate and professional degree programs. Through the Liberty University Online platform, Liberty’s School of Business offers an online associate of arts in business degree program designed to meet the needs of busy, working adults. Students in the online business degree program can transfer a significant number of credits from other schools, but all students must complete at least 15 credits through Liberty University. In keeping with Liberty’s evangelical mission, students in the online associate degree in business program must complete coursework in Christian thought. Campbellsville University is a private Christian university that was established in 1906. It enrolls over 7,000 students in a variety of undergraduate, graduate and professional degree programs. Initially founded as a school for boys, the institution gained full university status in 1996. Campbellsville University offers an online associate of science in business administration degree program for students who seek entry-level business leadership opportunities. Students in the online associate degree in business program must complete an internship. The courses last eight weeks each. Bethel University is a private evangelical liberal arts college that enrolls over 3,500 students in a variety of undergraduate, graduate and professional degree programs. Bethel was established in 1871 and began as a Baptist seminary. Bethel University offers an online associate of science in business and leadership degree program for students who want to pursue a variety of business leadership opportunities. This online associate degree in business program’s courses start every six weeks. Bethel University is accredited by the Southern Association of Colleges and Schools Commission on Colleges (SACSCOC). Concordia University is a private Lutheran university that enrolls over 7,000 students in a variety of undergraduate, graduate and professional degree programs. Founded in 1881, Concordia University – Wisconsin is part of the nine-campus Concordia University System. The Batterman School of Business at Concordia offers an online associate of arts in business management degree program for students who seek leadership roles in a variety of professional settings. Students in the online associate degree in business program must complete a capstone project. Concordia University Wisconsin also offers an online Bachelor of Science in business management. Concordia University Wisconsin is accredited by the Higher Learning Commission (HLC). Saint Leo University is a private Catholic liberal arts university that was established in 1889. It enrolls over 13,000 students in a wide selection of undergraduate, graduate and professional programs, and it has numerous online degree options. The university traces its origins to the 1881 arrival of Benedictine monks in Florida. Saint Leo University offers an online associate of arts in business administration degree program for students who want careers in the business world. Saint Leo students in its online business administration associate degree program enjoy numerous benefits, which include the option to pursue internships and participate in research conferences. Saint Leo University is accredited by the Southern Association of Colleges and Schools Commission on Colleges (SACSCOC). Excelsior College is a private college that was established in 1971. It enrolls over 34,000 students in a variety of online associate degree, online bachelor’s degree and online master’s degree programs. Excelsior specializes in serving busy, non-traditional students. To that end, all of Excelsior College’s programs are online. Excelsior College offers an online associate in administrative and management studies degree program for busy, working students who seek to advance their education and their careers. Students emerge prepared to pursue both a variety of careers or an online bachelor’s degrees in business. The online business degree requires 60 credits for completion. Excelsior’s courses are designed to meet the needs of working adults who seek professional advancement or career change. Students with relevant military training or education in the field may be granted academic credit for prior knowledge and experience. Hampton University is a private and historically black university that was founded in 1868. It enrolls over 4,500 students in a variety of undergraduate, graduate and professional degree programs. The School of Business at Hampton University offers an online associate of science in business management degree program for students who seek to pursue business leadership opportunities. Graduates emerge ready to enter the business world. Graduates from the program may also pursue further study in an online bachelor’s degree program. Hampton University also offers an online Bachelor of Science in business management degree program. Hampton University is accredited by the Southern Association of Colleges and Schools Commission on Colleges (SACSCOC). Colorado Christian University is a private Christian University established in 1914. It enrolls over 7,000 students in a variety of undergraduate and graduate degree programs. The university began as the Denver Bible Institute and underwent many changes before it took its current form in 1989. The College of Adult and Graduate Studies at Colorado Christian University offers an online associate of science in business administration degree program for students who seek to enter the business world and pursue administrative leadership roles. In addition to the business major core, students in this online business administration associate degree program must complete coursework in biblical studies. Courses are completed in five-week blocks, and the program can be completed in two years. Colorado Christian University is accredited by the Higher Learning Commission (HLC). Endicott College is a private college that was established in 1939. It enrolls over 4,500 students in a variety of undergraduate, graduate and professional degree programs. Although it was originally founded as a women’s college, Endicott became co-educational in 1994. The Van Loan School of Graduate and Professional Studies at Endicott College offers an online associate of science in business degree program which is designed to build aspiring business professionals’ skills and knowledge. Graduates of this online associate degree in business program may choose to join the workforce or continue their studies in the Endicott College online Bachelor of Science in business management degree program. Chaminade University of Honolulu is a private Catholic university that was established in 1955. It enrolls a small student population of over 2,000 in a variety of programs; these programs include online associate degree, online bachelor’s degree and online master’s degree programs. The university traces its origins to Marianist priests who first arrived in the 1800s. The School of Business and Communication at Chaminade offers an online associate of arts in business administration degree program for students who seek to enter careers in a variety of business administration settings. Applicants to this online associate degree in business program may transfer up to 45 credit hours from a prior program. Chaminade University of Honolulu is accredited by the WASC Senior College and University Commission (WSCUC). Florida State College at Jacksonville (FSCJ) is a public college that was established in 1965. It enrolls over 21,000 students in a variety of undergraduate programs, which include online associate degrees and online bachelor’s degrees. The School of Business, Professional Studies and Public Safety offers an online associate of science in business administration degree program that is designed to give students the required business background for a diverse range of business leadership careers. Students develop the required knowledge and skills needed for a variety of entry-level positions as well as the qualifications for further study in online bachelor’s degree programs. University of the Incarnate Word is a private Catholic university that was established in 1881. It enrolls over 8,500 students in a variety of undergraduate, graduate and professional degree programs. The institution was founded by the Sisters of Charity of the Incarnate Word, and it was originally chartered as a women’s college. The School of Professional Studies offers an online associate of arts in business administration degree program for students who seek to enter leadership roles in the business field. Graduates of this online associate degree in business program emerge prepared for entry-level positions. Graduates may also choose to pursue further education through an online bachelor’s degree program. This online associate degree in business program’s courses last eight weeks each. University of the Incarnate Word is accredited by the Southern Association of Colleges and Schools Commission on Colleges (SACSCOC). Davenport University is a private university that was established in 1866. It enrolls over 7,000 students at its main campus in a variety of online associate degree, online bachelor’s degree and online master’s degree programs. The university has numerous campuses throughout the state of Michigan. The Donald W. Maine College of Business at Davenport University offers an online associate of business administration degree program which is designed for students who seek to pursue a variety of business leadership roles. Students emerge prepared for entry-level business positions. Graduates also emerge with the qualifications for further study in an online bachelor’s degree program. The University of Alaska Southeast is a public university that was established in 1972. It enrolls a small population of over 2,000 students in a variety of undergraduate programs; these include online associate degree and online bachelor’s degree programs. UA Southeast’s School of Arts and Sciences offers an online associate of applied science in business administration degree program which prepares students for a variety of private and public sector careers. Students may choose from either a general business emphasis, or an accounting emphasis. Students emerge prepared to enter the workforce or to pursue further education in an online bachelor’s degree program. The University of Alaska Southeast is accredited by the Northwest Commission on Colleges and Universities (NWCCU). The University of Toledo is a public research university that was established in 1872. It enrolls over 20,000 students in a variety of undergraduate, graduate and professional degree programs. Initially opened as a private trade school, the institution closed just a few years after its founding. Shortly thereafter, the city of Toledo reopened the school as public university. The College of Business and Innovation at the University of Toledo offers an online associate degree in business administration program which is designed both for students who seek to grow professionally and students who wish to continue into a bachelor’s degree program. The University of Toledo is accredited by the Higher Learning Commission (HLC). The College of Business and Innovation is accredited by the Association to Advance Collegiate Schools of Business (AACSB). Clarion University of Pennsylvania is a public university that was established in 1867. It enrolls over 5,000 students in a variety of undergraduate, graduate and professional degree programs. Clarion was initially founded as a seminary and has since became a public institution after being purchased by the state of Pennsylvania in 1915. The College of Business Administration and Information Sciences at Clarion offers an online associate of science in business administration degree program for students who seek to enter business careers or continue to a bachelor’s degree program. Graduates emerge prepared for entry-level positions or for further education in an online bachelor’s degree program. Clarion University of Pennsylvania is accredited by the Middle States Commission on Higher Education (MSCHE). The College of Business Administration and Information Sciences is accredited by the Association to Advance Collegiate Schools of Business (AACSB). Seminole State College of Florida is a public state college that was established in 1965. It enrolls over 17,000 students in a variety of undergraduate programs; these include online associate degree and online bachelor’s degree programs. The School of Business, Health and Public Safety at Seminole State offers an online associate in science in business administration degree program for students who seek business leadership roles as well as for those who eventually want a bachelor’s degree. The program also offers an AS to BS specialization for students who intend to earn an online bachelor’s in business administration. Seminole State College of Florida is accredited by the Southern Association of Colleges and Schools Commission on Colleges (SACSCOC). Southern New Hampshire University is a private university that was established in 1932. It enrolls over 90,000 students at all levels. Its massive enrollment largely consists of students who earn their degrees entirely online. This is possible because of SNHU’s wide selection of online associate degree, online bachelor’s degree, online master’s degree and online doctoral degree programs. Southern New Hampshire University offers an online associate of science in business administration degree program for students who seek a flexible path to business leadership opportunities. Graduates emerge prepared to enter the workforce or to earn an online bachelor’s degree. Campbell University is a private university that was established in 1887. It enrolls over 6,500 students in a variety of undergraduate, graduate and professional degree programs. Campbell University offers an online associate of arts in business administration degree program for students who seek to enter business leadership roles. Graduates emerge not only prepared for entry-level positions in businesses but prepared to earn an online bachelor’s degree as well. Campbell University is accredited by the Southern Association of Colleges and Schools Commission on Colleges (SACSCOC). Limestone College’s Division of Business and Professional Studies offers an online associate of arts in business administration degree program for students who seek to enter the business world and pursue administrative leadership roles. Graduates are prepared not only to pursue entry-level positions in the field but to pursue further study in an online bachelor’s degree program. This online business administration associate degree program’s courses are completed asynchronously in eight-week blocks, with six terms per year. The program may be completed in less than two years. Limestone College is accredited by the Southern Association of Colleges and Schools Commission on College (SACSCOC). An online Associate degree in Business Administration provides students with broad business knowledge and training, preparing students for entry-level work in a variety of industries, such as entry-level business management positions. The degree covers business administrative fundamentals and interpersonal skills. Some schools provide concentrations in specific areas of business administration such as human resources, healthcare administration or information systems. As with most associate degree programs, you can normally complete an online Associate in Business Administration degree in two years or less with full-time status. The programs featured here typically require 60–61 credit-hours to complete. Online students may be able to shorten that time by transferring previously earned credits, testing out of classes, or in some cases applying for life experience credits. An Associate of Applied Science (A.A.S.) in Business Administration Degree Program is a program that focuses on practical, vocational business training while teaching some of the theoretical aspects of business administration. These degree programs often attract individuals who seek employment immediately upon graduation. Some of the A.A.S. degree programs require students to select a specialty or an area of emphasis early in the program—such as management, banking and finance, or marketing — to prepare them for entry-level jobs within a specific field. An important note: Some A.A.S. classes do not have credit transfer equivalency and may not fulfill general education requirements for a bachelor’s degree. Associate of Arts (A.A.) and Associate of Science (A.S.) degrees attract students who plan to enroll in a bachelor’s degree program immediately after graduation. In general, an Associate of Applied Science degree may require more credits than an Associate of Science or an Associate of Arts degree. Compared to A.S. or A.A. programs, A.A.S. degree programs typically emphasize technical and career training throughout the program. Typically, an Associate of Arts degree emphasizes the humanities while an Associate of Science degree emphasizes math and science. What Kinds of Jobs Can I Get with an Associate in Business Administration Degree? See also: What Can I Do with a Business Degree?